Shiva and Shakti were worshipped throughout India since ancient times. 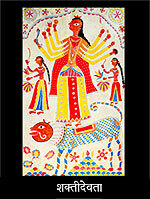 A myth related to the origin of centers of Shakti or the female aspect is narrated in the beginning. The Purana explicates the mythological development of a deity while the Mahatmya narrates the importance of a particular place of worship. Both are important sources of information. Each source varies from the others in its enumeration (108, 51, 18, etc.) of important centers of worship. However, centers of Shakti or Devi at Mahur, Tulajapur and Kolhapur, all situated within Maharashtra, are recognized and revered throughout India. The number ‘three and a half’ corresponds in number with syllables in the ‘Omkara’. The three centers in Maharashtra are accorded equal status. The site at Vani is regarded as ‘the half’, implying that it is a partially important centre. The author emphasises the importance of their power rather than geographical location. After a brief description of the geographical location, The author mentions a myth related to its origin as a place of worship. The eight - handed idol of the deity is described in detail. One of the adjectives used for her is ‘the one blessing Rama’- Ramavardayini. It is used by various saint poets such as Eknath and Ramdas. The deity at Mahur is known as Renuka. Elsewhere she is known as Yallamma, Yamai, Matangi etc. She finds mention in sources such as Shrisukta and Renuka Puran. She might have originally been Renuka before exaltation to comparative sophistication. It is referred to in Devi Bhagavata. She was worshipped by the kings of Yadava dynasty in the thirteenth century C.E. and by the Shilahar dynasty before them. A Rashtrakut king, Amoghavarsh, had sought the blessing of the deity to save his subjects from an epidemic. Some prominent scholars opine that the temple might have been built by the Sind kings before the Rashtrakutas. The geographical location is described. She is revered in the songs of aboriginals. Her place of worship is mentioned in Mahanubhava literature, and by saint-poets like Dnyandeo, Niranjan Madhav etc.